But sometimes this is not enough, as plugins can leave some shortcodes, or other artifacts in your content. They are not removed automatically by weeblrAMP, simply because they are valid AMP content, but they simply may not look good. 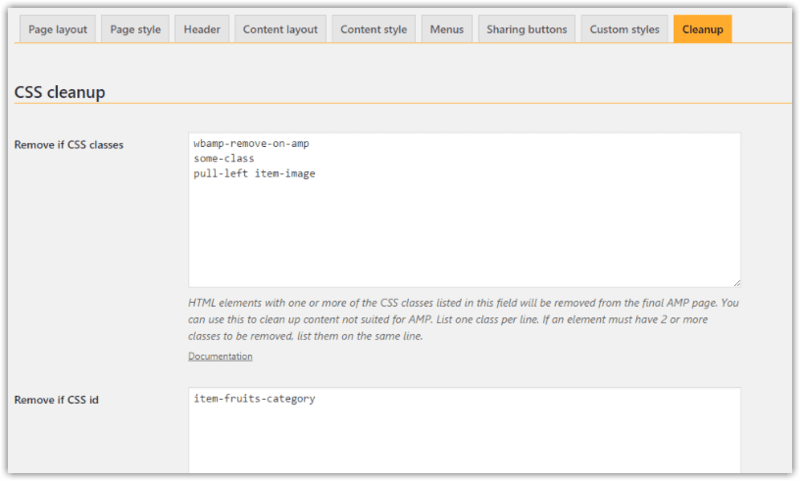 weeblrAMP can remove from AMP pages any HTML element that has CSS class(es) or a CSS id(s) in a specified list. Enter one or more CSS classes or ids in the corresponding input field, one per line. If an HTML element has one of the classes, group of classes or ids on that list, it will be automatically removed from any AMP page. If you cannot modify the CSS classes/id of an element you want to remove, you can just list CSS classes or id it already has. Beware that maybe other elements have the same classes, so you may cause multiple elements to be removed. You may need to adjust the list until you get the desired output. Ids are simpler has there should (theoretically) only be one element per page with a given id. However, in practice, fewer elements have ids. The regular expression in the first part of the line will be run before the page is displayed (using PHP preg_replace), and the text it matches will be replaced by the text replacement_text, which must be between double-quotes. To remove some content, just make the replacement_text equals to "". This cleanup expression will cause the text [slider] to be replaced with <br />, each time it is found in a page content. Enter a ; as the first character of this line. This can be used to add some information about your cleanup expression, for easier management. Simply enter a - as the first line of the input field (you do not need to delete the rest of the field).